Lauren Alaina was voted Breakthrough Artist-Writer of the Year at the recent MusicRow Awards. The talented 22-year-old called from the road to discuss her award and more. 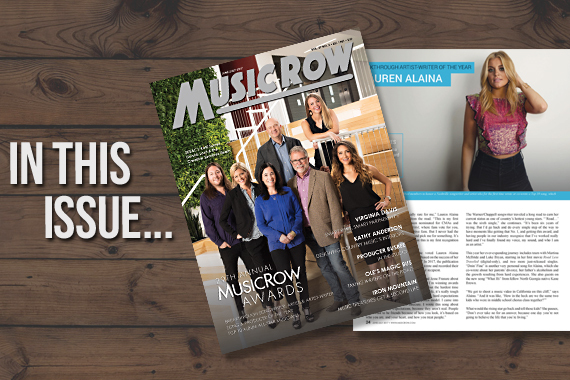 Pick up a copy of the MusicRow Awards print issue to read the full feature, or subscribe to MusicRow today to receive your complementary print issue. What did you learn during your recent CMT Next Women of Country Tour with Martina McBride? It was really cool for me to be on the road with a female. I’ve been on the road with Luke Bryan, Jason Aldean, Alan Jackson and Sugarland, but I’ve never been on a solo female tour. I learned so much from her. She’s the nicest person on the planet, and so much fun. She really took me under her wing and we keep in touch. She’s won all kinds of awards—she’s MARTINA MCBRIDE—and she’s still a good person and cares about people. I love that about her. I learned that you can be gracious always. She has proved that women can make it in this business. She still goes out and plays shows. That’s what I want—to still be able to play music when I have a family and kids. I learned that talented people and hard workers can make it, regardless if they are male or female. She’s amazing. You are featured on Kane Brown’s new single, “What Ifs.” How long have you two known each other? I grew up with Kane and we’ve been friends a long time. We went to Lakeview Middle School in Ft. Oglethorpe, Georgia together. We had completely different ways of coming into this business. He started with videos online and I started with Idol. Not the traditional ways. It’s cool that we each took a different route. I think when you are from that area, you kind of have to, because no one is there to give you advice. Now we have “What Ifs” together. We got to shoot a music video in California. It’s super dramatic. I’m in a flowy dress and I’m following him through the wilderness, and we end up on this perfect cliff. I was like, “How in the heck are we the two kids who were in middle school chorus class?” Back then he was so shy but I made him sing in front of the class. How is this our lives now? It’s crazy and sweet, and it’s meant to be. Our friendship is special and important. We lost touch for a while and the music reconnected us once he moved to Nashville. Now we have someone from home. What would you go back and tell those middle schoolers? Just wait. And don’t ever take “no” for an answer, because one day you’re not going to believe the life that you’re living.